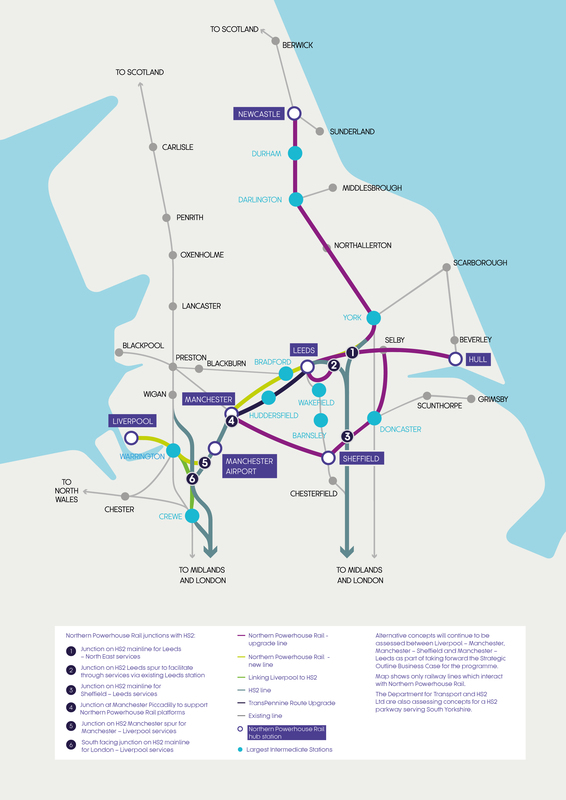 ► Recognise the critical role of Northern Powerhouse Rail in regeneration and growth, working with the North's 11 Local Enterprise Partnerships (NP11) to refresh the Northern Powerhouse Strategy and provide funding to develop Northern Powerhouse Rail Growth Strategies. The document itself will remain confidential whilst considered by Government. It outlines several concepts that will form the basis of further detailed development over the next 18 months, funded by an additional ₤37 million allocated in last Autumn's Budget. ► A new line linking Leeds and Manchester via Bradford, including the option for a Bradford City Centre Station. ► A new twin track line, linking Liverpool to HS2 and onwards to Manchester and other Northern cities, via Warrington and Manchester Airport. ► Significant upgrades and integration with HS2 linking Leeds and Sheffield. ► Significant upgrades between Sheffield, Leeds and Hull. ► Significant upgrades of the Hope Valley corridor between Manchester and Sheffield. ► Significant upgrades between Newcastle and Leeds. ► Hub concepts for Northern Powerhouse Rail Stations. The decision came on the day that members also approved the:- 'Strategic Transport Plan,' a blueprint for investment in the North; set to be formally launched at an inaugural conference, in Sheffield, on Monday, 11 February 2019. 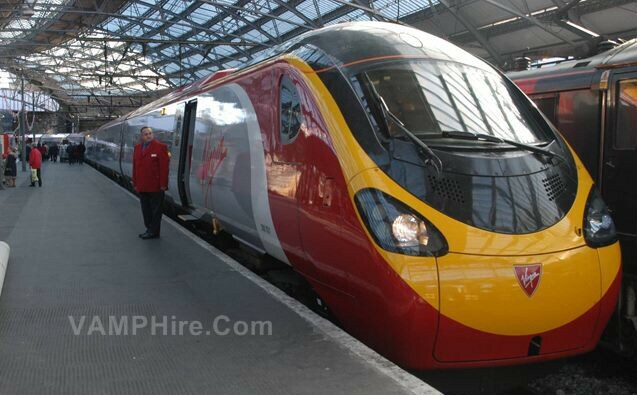 Tim Wood, Transport for the North's Northern Powerhouse Rail Director, said:- "Our leaders had a vision to connect the North by rail like never before. Today, we are a step closer to making that a reality. In Northern Powerhouse Rail, we have turned ambition and passion into a robust evidence base for investment of up to ₤39 billion. It provides viable options and solutions to the North's rail challenges. For too long, passengers and businesses have been held back by slower than average train speeds and poor connectivity between our City Regions. If we're going to re-balance the UK's economy, this needs to be tackled head on. There's no let up. While the Government considers this case, we will begin the more in depth design and feasibility work that will take us closer to a final preferred network. If we get the right level of support and investment, the aim is to begin construction in 2024. With this 1st, high level business case, we put investment in the North's Rail Network firmly on the agenda. It lays bare our ambition. From the North, for the North." Lisa Bowden, Head of Infrastructure in the North at Mace added that:- "The North brought the very 1st railways to the world and we're now on the cusp of a 21st Century transport led revolution that will empower the Region once again. This historic agreement demonstrates the power of having one voice amongst our leaders. Northern Powerhouse Rail would not only ensure people can travel more efficiently, it will also enable wider regeneration in our towns and cities and will underpin our growth in a Post Brexit economy." XLR Executive Jet Centre Liverpool, have hosted an event at Liverpool John Lennon Airport (LJLA) to showcase the Gulfstream G280 super midsize business jet aircraft to potential users. This class leading aircraft has a range in excess of 4,000 miles, with the capability of flying non stop from the UK to New York and this event was the 1st time this aircraft type has visited the North West of England. The event was also an opportunity for XLR, which is the premium travel brand and subsidiary of Rigby Group plc, to promote their new state of the art executive jet centre, which opened in 2018, at Liverpool John Lennon Airport. THE BIG Model and Hobby Show is a new event for the Southport area. It will take place on Saturday, 10 August 2019, from 10am to 4.30pm, at the Southport Theatre and Convention Centre. As many of you know Woodvale Rally has finished, but the organisers, GIMRA North West, hope that part of the Rallys' legacy will live on through this event. But they stress that this is only a test event, with the hopes of making this an annual event, if it works, so please do support it! The BIG Model and Hobby Show feature a large range of models on exhibition, as well as a range of society stands and trade stands, plus much more, like a special Star Wars display! Already we have confirmed are several large working model railway, G1, G Scale, 16mm, 0 Gauge, 00 scale displays, along with a layout that has to be seen to be believed, Dobson Bridge, in Gauge 1. On show will be a wide range of model boats, model cars and model aircraft. Not only that, but the event will offer a wide range of demonstration and also some interesting surprises, to be announced as we get closer to the event... If you think this event is just for model transport and sci-fi, think again, as we will also have a collection of unique dolls houses and dolls on display. To keep up to date about the event, keep an eye on the events Facebook Page.